Pour L'amour de Fashion! : Reader Mail! Reader Mail! I love Reader Mail! And so readers, in the 1st Reader Mail post ever.... 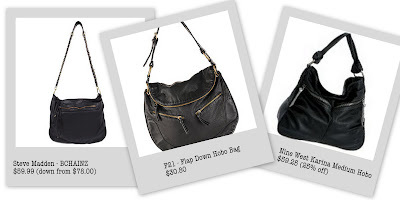 The Inexpensive Everyday Black Purse! At: Steve Madden (+ 15% off orders of $50 or more and Free Shipping with code SHOPIT15 at checkout); Forever 21; Endless (Free 2-day Shipping); Urbn and Urbn. 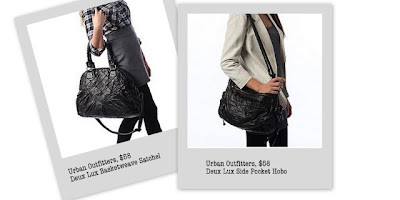 My favorite is the last hobo from Urban, I also really like the first Steve Madden bag, I had considered it myself in the past. I would also recommend H&M, which you can't shop online, they definitely have cute bags, but not necessarily great quality. Nordstrom Rack would also be a good place to try, and most boutique shoe stores sell handbags at varying price points. I hope this helps! Everyone should feel free to send me questions, comments, post suggestions etc., I am a pro online-shopper (with an amateur budget), and I'll totally do it for you.